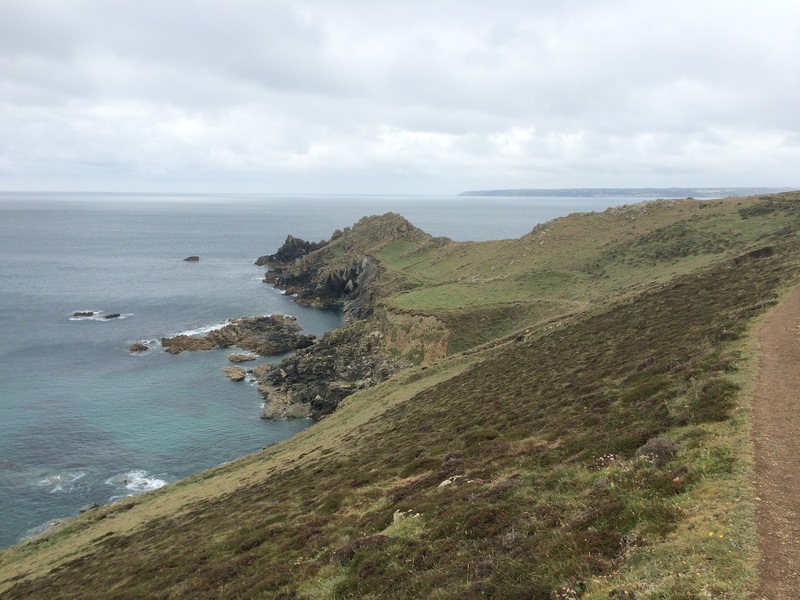 Only half a week, but enough time to get all the way around Mount’s Bay and to Britain’s most Southerly mainland point. 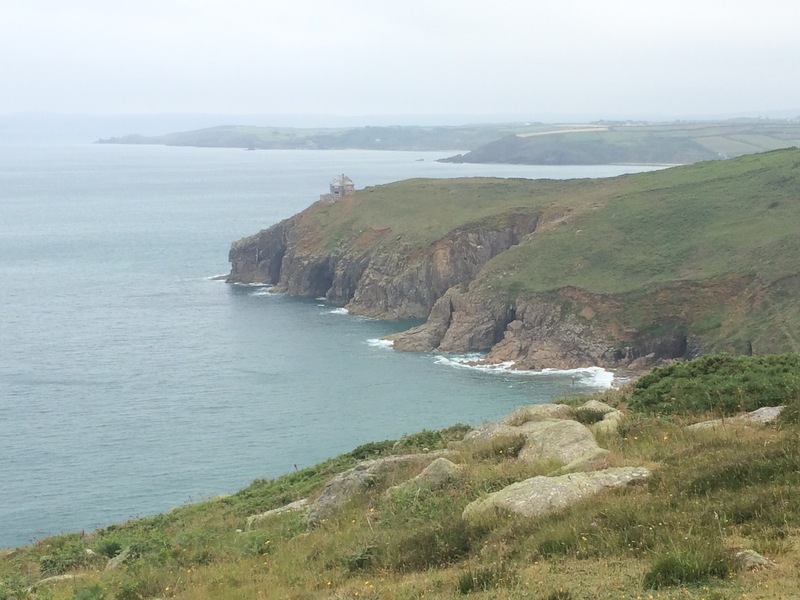 Rounding Lizard Point I felt like I’d turned for home. ﻿The good weather finally broke this week, although hopefully it will return. There has been another change in the landscape this week. Firstly the sandy beaches have been much coarser, more grit-like than before. 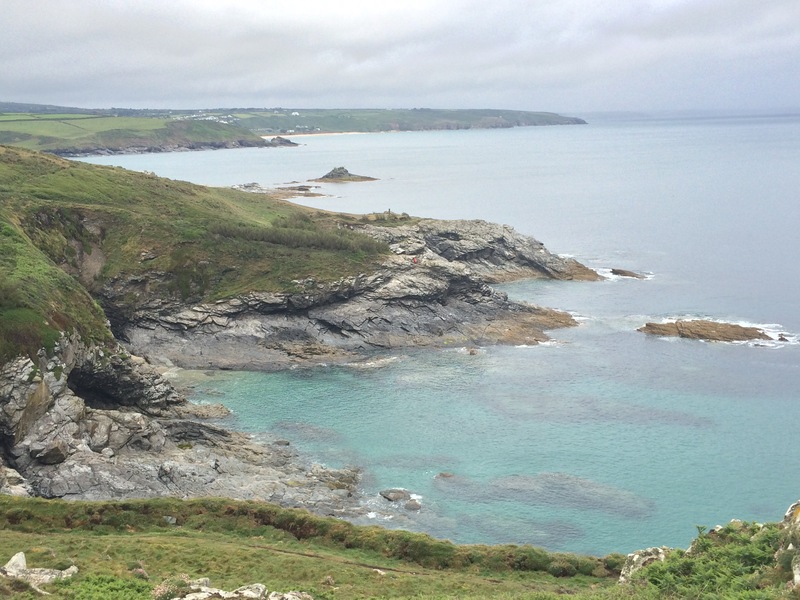 Secondly, the rocks changed around the Lizard Peninsula. 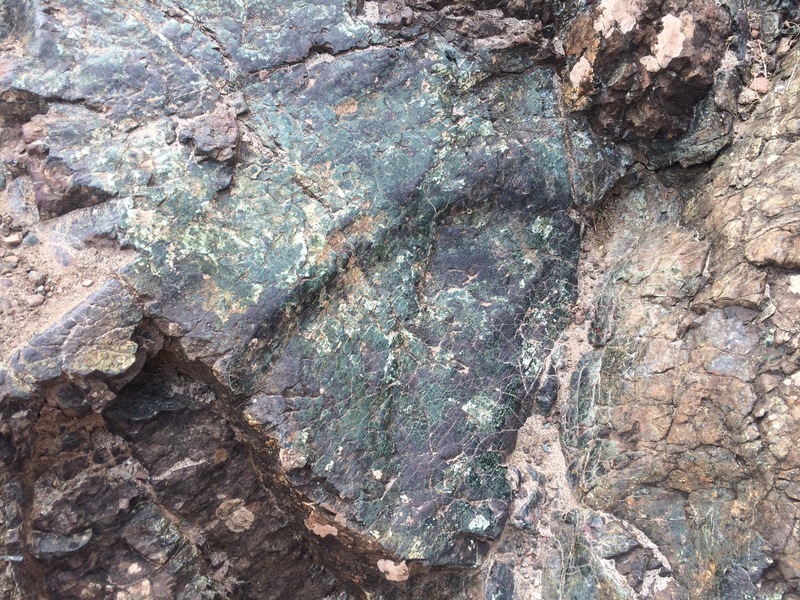 I learned that I was seeing a lot of Serpentine rock as I walked through the, quite extensive, Lizard National Nature Reserve. In my latest map pack-up I also received a new pair of sunglasses (an emergency purchase after kneeling on my other ones and breaking them) and a belt for my increasingly baggy shorts. Finally I no longer need to wear my shorts as if I’m a teenage boy. 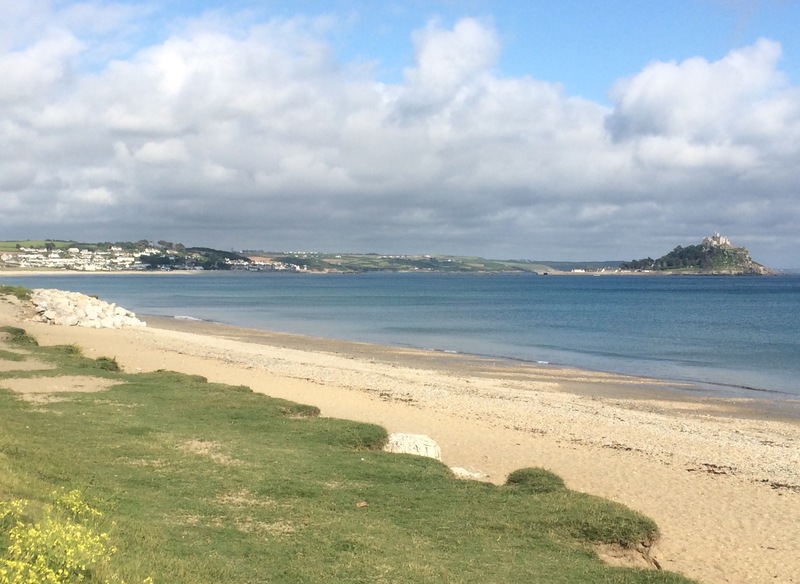 After all the heavy rain during the night I awoke early to sunshine so I packed away quickly and headed into Marazion. 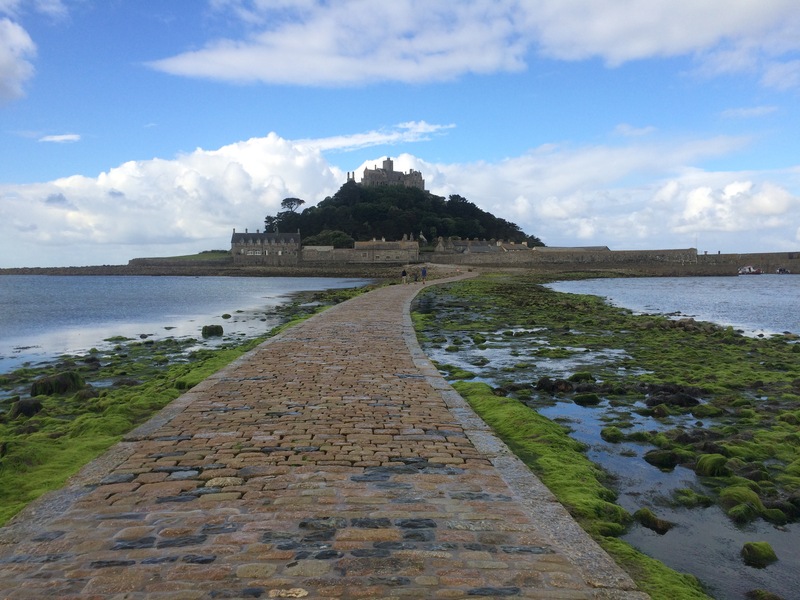 The causeway to St Michael’s Mount opened from about 8 am so, when I arrived at 8.30, I had the place almost to myself because it was early. 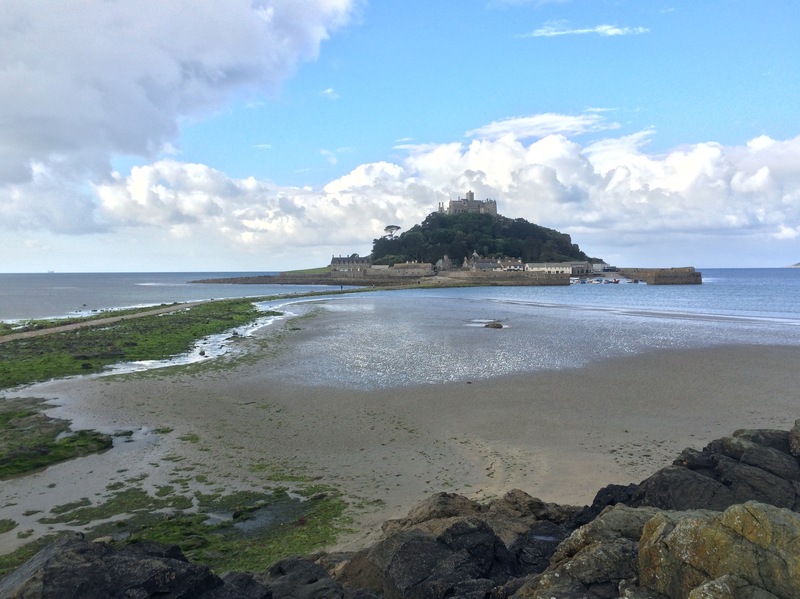 For over 3 centuries around 1000AD St Michael’s Mount was controlled by the abbey of Mont-St-Michel. 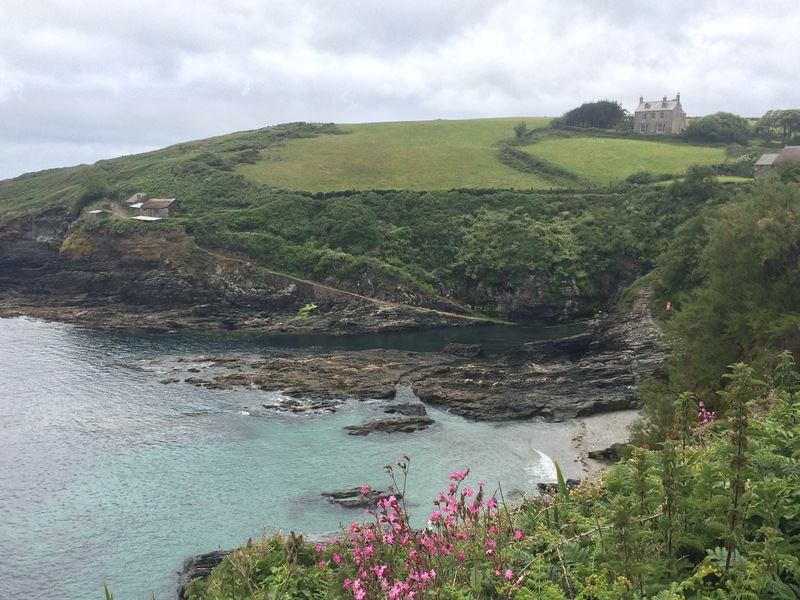 It is now jointly owned by the St Aubyn Estate and the National Trust. 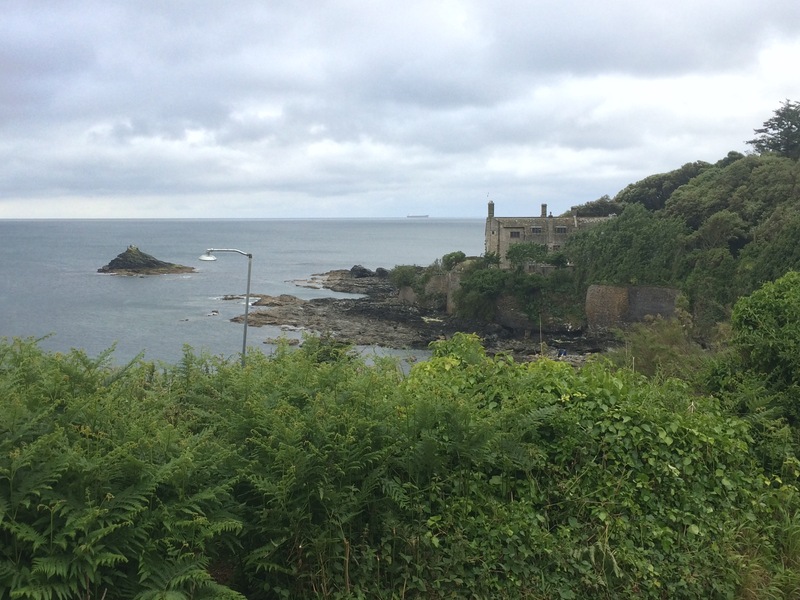 The St Aubyn family has been living in the castle since the 1650s. It does look magical. I was too early to go into the gardens or the castle but I did get a look around the information room and a chance to enjoy the solitude in the sunshine. 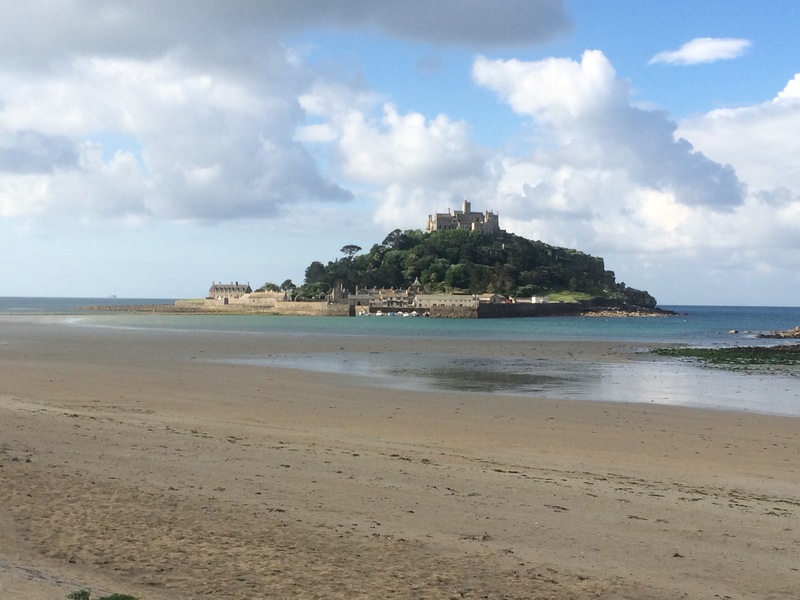 By 9.30 a steady stream of people were starting to cross to the island so I walked back across the causeway. Workmen were rebuilding parts of it that were destroyed in the January 2014 storms. Clouds now covered the sky and I ducked into The Godolphin Arms for some breakfast. I ended up staying for longer than anticipated as heavy rain started falling. Two coffees later and I had to leave. The rain was easing to a light drizzle, which was on and off all afternoon. 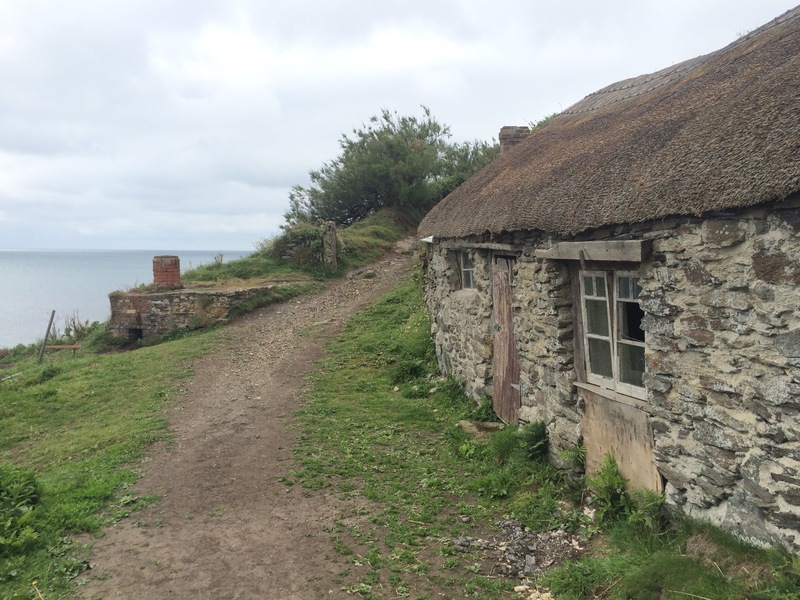 I headed out to Cudden Point and around to Prussia Cove; a tiny settlement with An interesting name, evidence of an ancient slipway and 2 thatched cottages. Just around the corner, at The Enys, was what looked like an Elizabethan mansion. Had I stepped back in time I wondered? 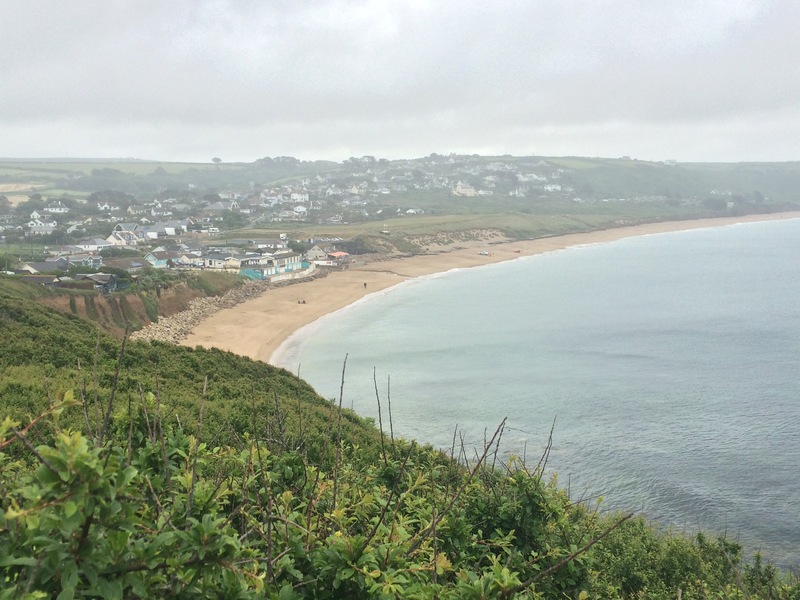 Approaching Praa Sands and the rain was falling again. 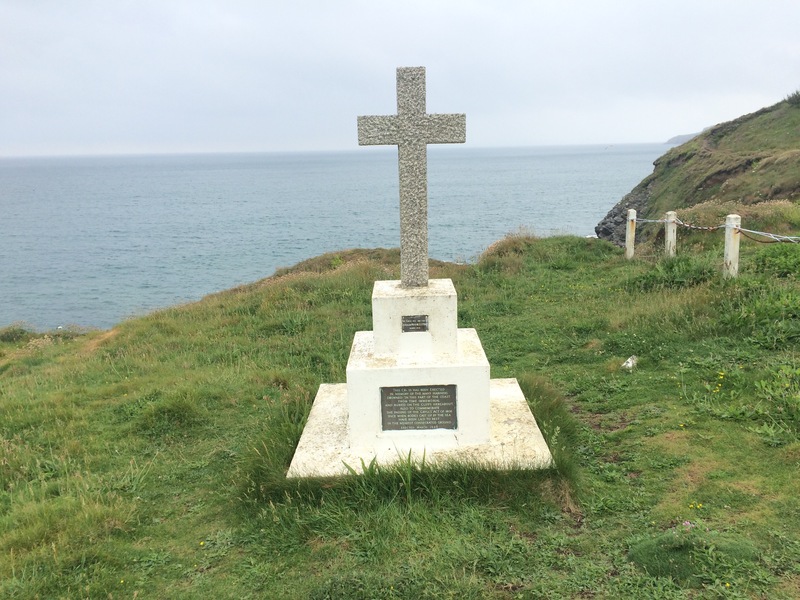 This was not right, according to family folklore it’s always sunny at Praa Sands! There was still one family sitting on the beach in waterproofs. They must have been English. No Punch and Judy today! 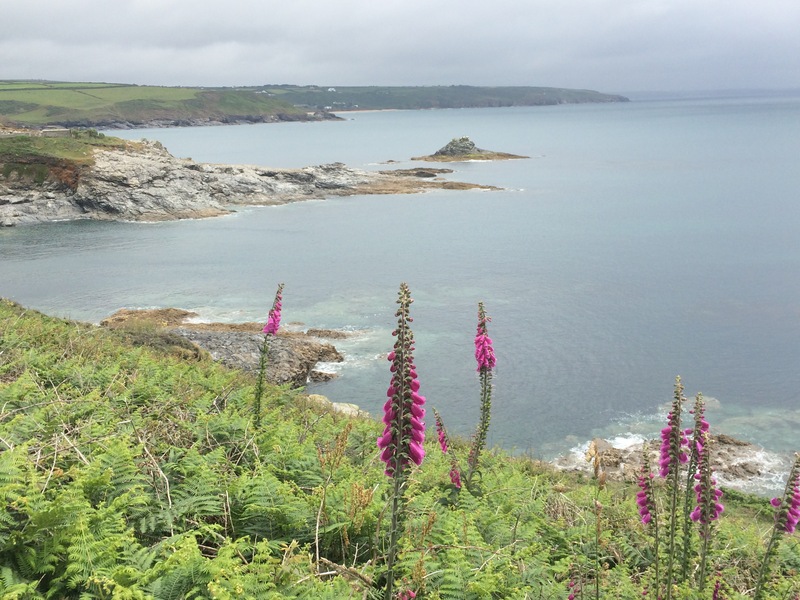 I stopped at the beach cafe for a cup of tea and a cake, and a break from the rain. 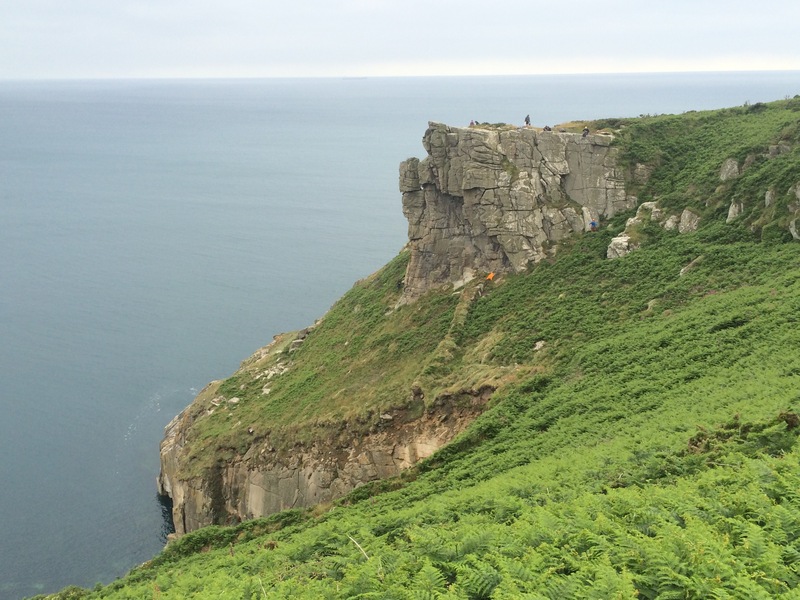 Around Trewavas Head I saw a Cornish Chough and a load of rock climbers. 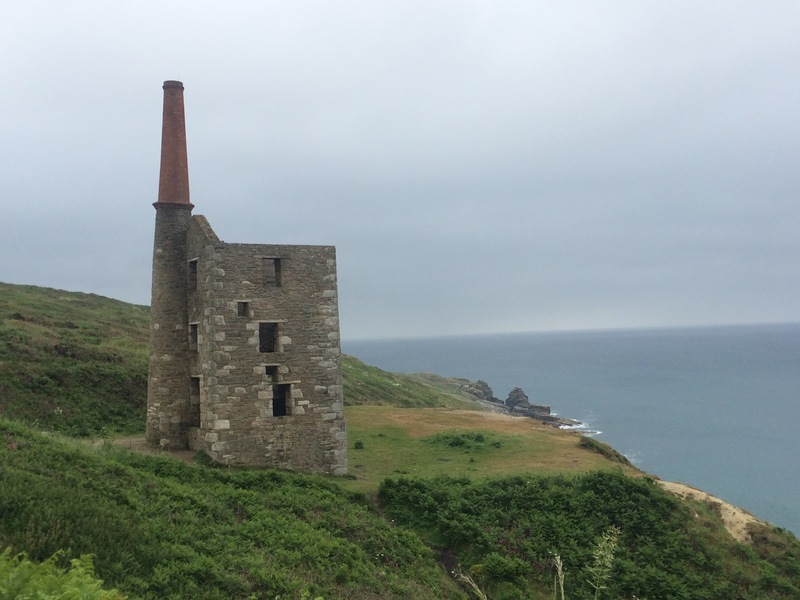 I was back in tin mining country and walked past 3 old mine workings. 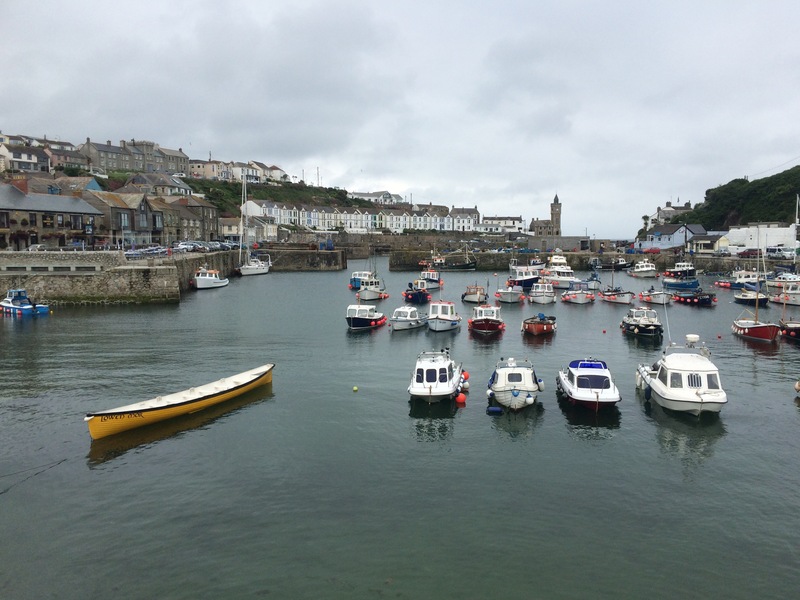 I reached Porthleven and briefly stopped to admire the harbour before heading to the Post Office. I had to collect my latest map parcel that I had sent to me before I decided to take a trip home. I was delighted to find several birthday cards sent post restante as well – thanks to those that sent them. Had I not gone home I would have received them on the correct day, this way I let myself have a 2nd birthday and decorated my tent with the cards. Birthday dinner was a curry and a pint in The Harbour Inn. Another long train journey to get back to Penzance. Fortunately I like trains. 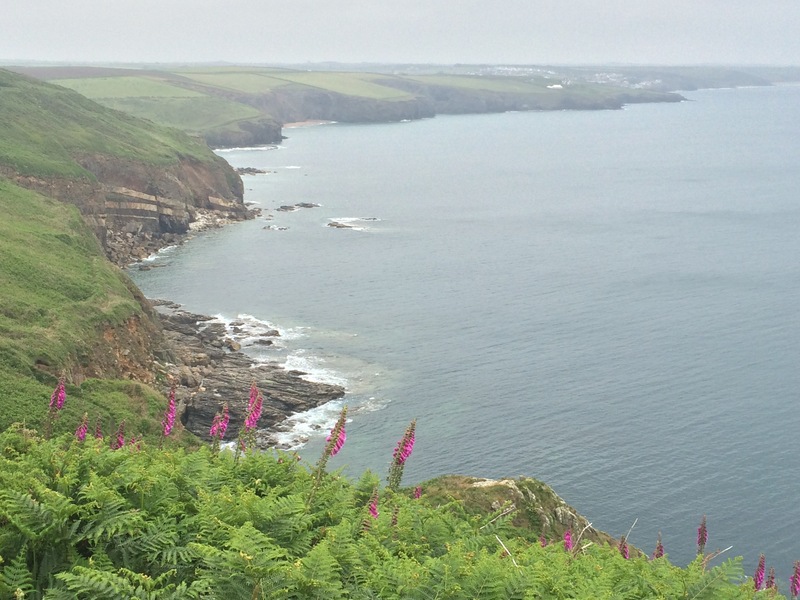 And the train line to Penzance is mostly very scenic. I found I was looking forward to getting back to the coast so that was a good sign. Sadly, a consequence of my unplanned journey home was that I missed out on the opportunity to go swimming in Penzance’s re-vamped Jubilee Pool. It only re-opened 2 weeks ago and looked lovely when I passed it on Saturday (it was closed then). Something for another trip. 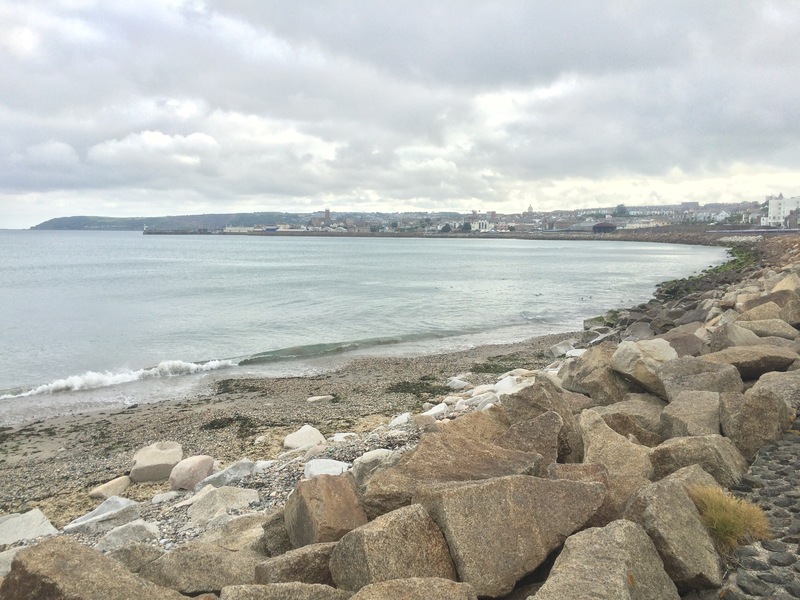 I arrived in Penzance at 5.15pm and walked the 3 miles around the apex of Mount’s Bay to Marazion. I walked between the train track and the beach. 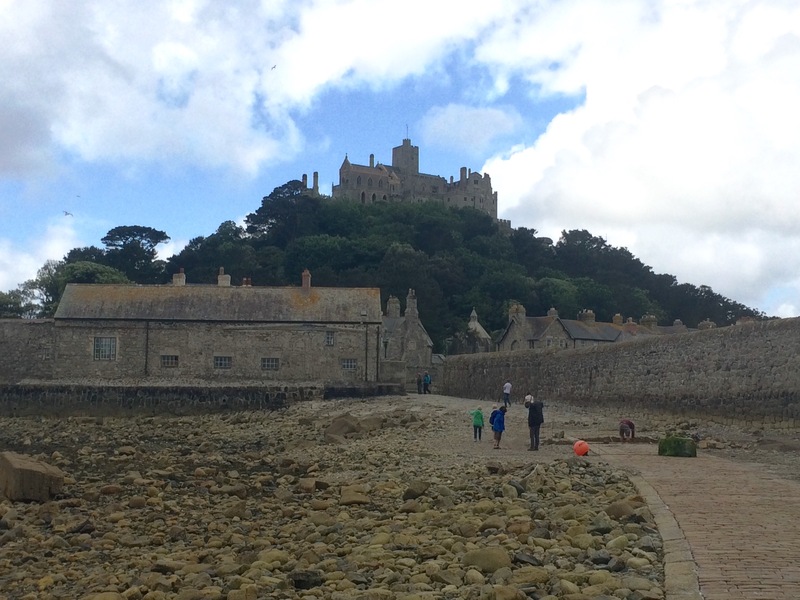 There were good views of St Michael’s Mount all the way along. No sooner had I pitched my tent and been for a shower than it started raining. I finished off my picnic lunch in my tent and had an early night. The heavy rain continued into the night. Only three and a half days at home, but it was just what I wanted. I didn’t go anywhere (well I don’t have a car). I did manage to wash everything, including my rucksack, which I think was possibly more smelly than my t-shirt, and all footwear. Finally I can no longer smell my own feet, and that’s a really positive thing. I took the opportunity to sort through my kit and I ditched my cooking equipment. 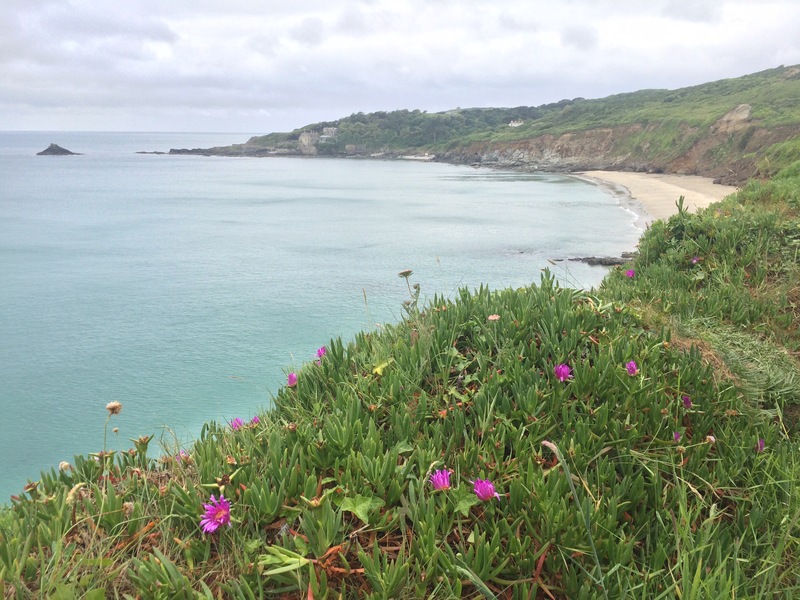 I have only been using it as a last resort and have found the SW Coast Path to be well populated with cafes, pubs and shops. I decided to follow the example of all the European walkers I have met and not carry any cooking equipment. My unexpected trip home was a wonderful pick-me-up tonic. It also enabled me to try and do a bit of gardening (hampered by very heavy downpours and a lack of desire). Most importantly, my EU Referendum postal vote is in. 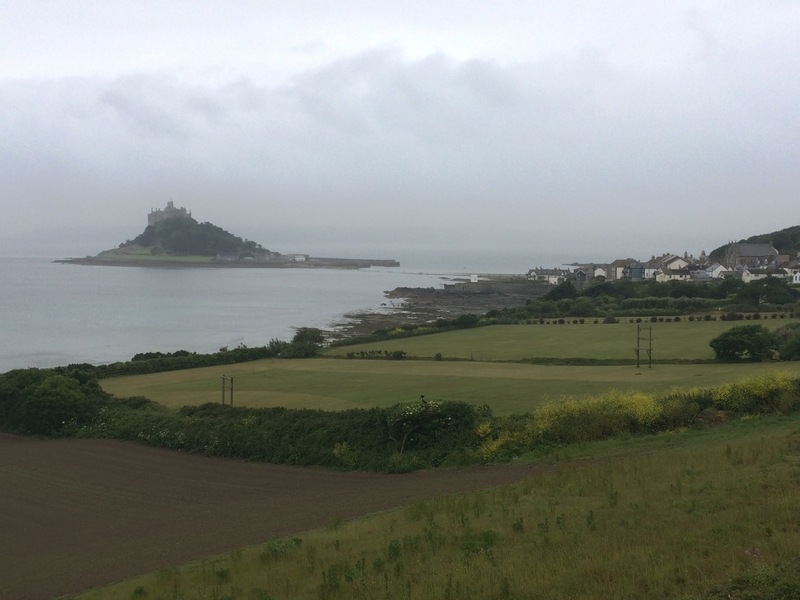 When my ferry arrived in Penzance yesterday it started raining. It carried on raining all night. Despite not walking that much over the last 2 weeks I was starting to feel really tired (the cold didn’t help). I had just had a few days of holiday and yet still felt like I wanted a break. It had been 11 weeks since I was last at home. I caught the train and was home mid afternoon. Bliss. I might also have to fit in some gardening while I’m here. 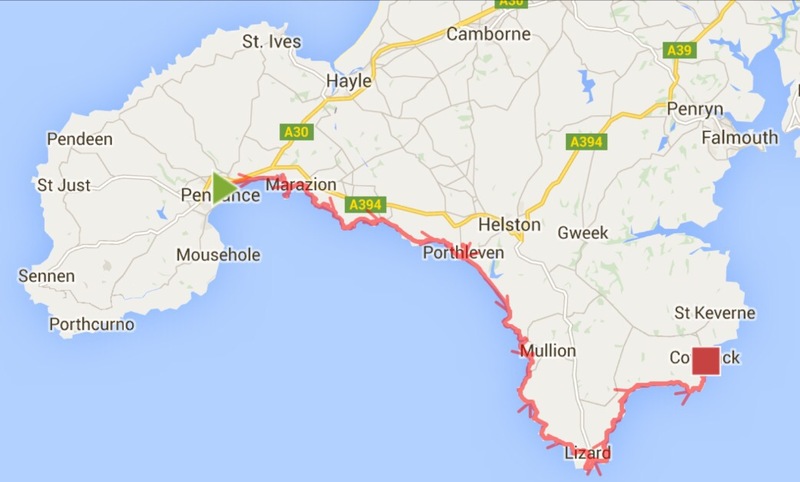 I planned to return to Penzance on Thursday.